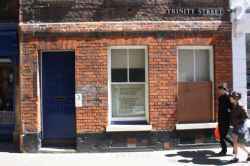 Trinity Street Surgery is a doctors' surgery with GPs and nurses providing diagnosis, treatments and advice for a wide range of medical conditions. Based in Trinity Street, Cambridge, Trinity Street Surgery is a doctors surgery. Trinity Street Surgery is in Trinity Street Cambridge. You can view a list of neighbouring businesses by going to the Trinity Street page. Note: the pin is positioned at the postcode centre, and may not correspond with the precise location of 3 Trinity Street.